In order to maintain your fireplace in optimal condition for year-round usage, it's a smart idea to invest in this 150mm solid fuel rain cap. This solid fuel rain cap has been constructed using only the finest materials to guarantee durability as well as longevity. It is ideal for use on fireplace installations that operate using oil or solid fuel in non-open areas. The main purpose for installing this well-built 150mm solid fuel rain cap is to prevent any water from coming down the flue and damaging the fireplace. 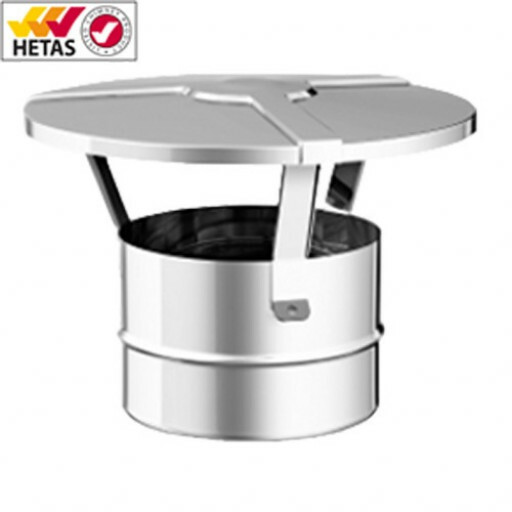 It is designed to be easily installed on top of the flue system. Many homeowners don't realise that simply using a rain guard that fits around the exposed masonry to prevent rainfall from eventually wearing away the masonry doesn't provide enough protection. This 150mm solid fuel rain cap does an excellent job of covering the flue itself in order to keep falling rain or other moisture from traveling down the flue and disrupting the operation of the fireplace. Another great advantage to installing a 150mm solid fuel rain cap is that it deters birds and small animals from entering the flue and building their nests there, easily disrupting your plans to enjoy your fireplace for heat and warmth.